Need to attract attention to a particular product or service? Double-sided light boxes perform this task twice as well. Thanks to their bright illumination, your advertising graphics will display on a whole other level. Their impact cannot be overstated. 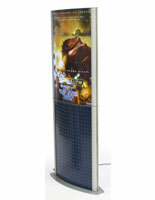 Double-sided light boxes attract the eyes of consumers much more effectively than traditional printed posters. Whether placed on a busy sales floor or hung behind storefront windows, these marketing tools are designed to be noticed! 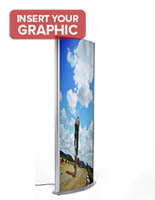 Displays2go stocks a huge selection of single-sided illuminated poster frames. 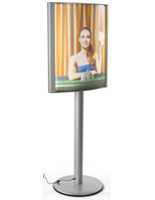 Double-sided light boxes, on the other hand, work twice as hard in getting your message out to potential customers. 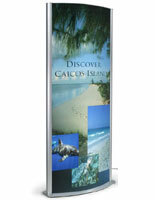 What kinds of backlit poster displays are available? Double-sided light boxes feature two types of illumination. Larger models, as in the case of the floor standing totems, use standard fluorescent lighting. The bulbs are situated right behind the center of the viewable area to provide the most amount of light. Smaller frames utilize light emitting diode technology. Since the LED bulbs are located along the sides, the light needs to be extended across the viewing surface. 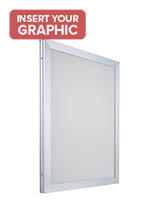 A diffusion pattern distributes even illumination when lightboxes feature edge-lit lighting. Our free-standing illuminated signs come in a nice variety of choices. 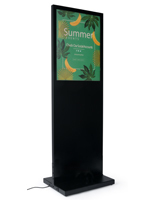 These range from standard poster-sizes mounted to poles, on up to very large totem displays that feature graphics over six feet tall. 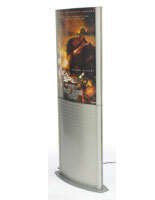 Placement is key with these floor stand models. Make sure they are seen by passersby in mallways, lobbies, or other high-traffic areas. 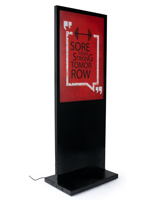 We sell stands with black or silver finishes with straight or curved poster faces. Hanging models are designed to be displayed behind storefront windows. Backlit advertisements that can be seen indoors or out emphasizes sales promotions, services, or whatever your business sells. 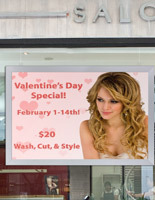 Your custom printed signs will project professionalism while targeting potential customers! This type of illuminated advertising begs for high-quality imagery. 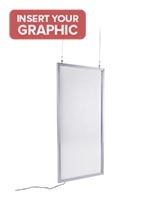 Therefore, lightboxes require specific printing materials for the best results. We highly recommend special backlit film, one of which is called Duratrans, for use in these illuminated sign displays. Unlike printed paper, this film provides the richest colors and darkest blacks without showing a "washed-out" effect. For the most part, these backlit LED sign frames are not cheap by any means. Display them to their best advantage by using the right print materials. How you project your business to potential customers is as important as the product itself.